Whilst it rained over the last couple of weekends we turned our attention to inside projects, it was time to start laying floorboards again. As we are using salvaged second hand timber it is filthy work, cleaning enough boards for two rooms takes a whole weekend. Previously we had used a homemade ‘gizmo’ to clean inside the grooves and the tongue, this time however PC hit upon the brilliant idea of using a saw to clean out the inside of the groove, much faster and cleaner. each of the joins had to be sanded flat and the entire floor was lightly sanded in preparation for the gluing. All this preparation and storage of course took place in my dining room! I confess to being a little frazzled by the second week, clambering over timber to access the school cupboard was frustrating. After PC cut each length, he then had to router a tongue into the ends of each board so we could secret nail the floor. This took an entire day. 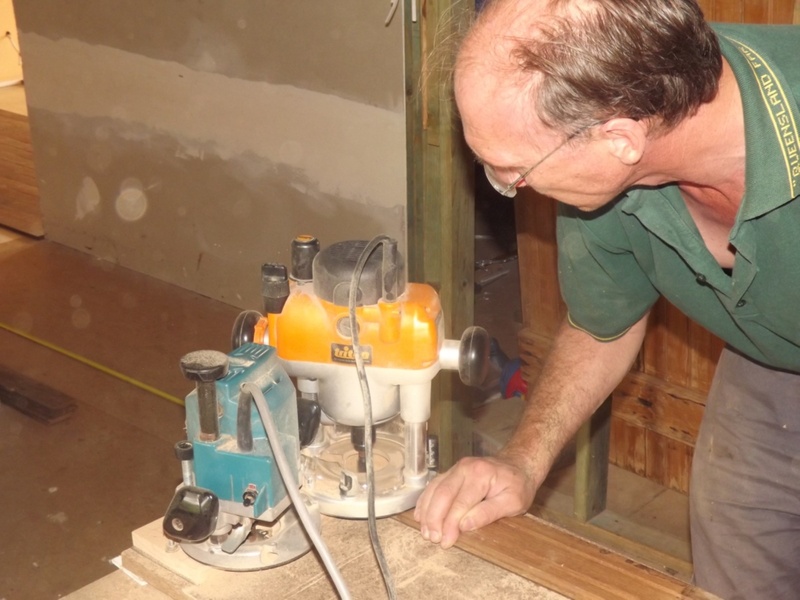 On the fourth day (second weekend) we began laying the floorboards in the younger boys’ bedroom. As we hire the gun for only a day, we begin a ‘race against the clock’ to lay the entire room in that day. Jem was eager to help lay ‘his’ floorboards and was a great offsider, doing odd jobs and standing on the timber pressing down onto the glue. The rhythm continued all day finally finishing just before tea. The boys were eager to move back into their ‘new’ room. such hard work – but looks marvellous! Love the ironic title of your blog. What a rewarding job. thanks for your enthusiasm and encouragement, and yes we are blessed with 'many hands'.